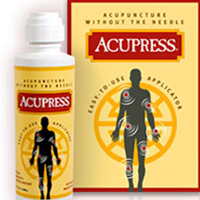 Acupress provides fast, effective pain relief. It comes in a 4 oz easy to use, mess free topical applicator bottle, which instantly soothes any areas of discomfort. Perfect and convenient to use whether you have headaches, migraines, joint or body pains, arthritis, or any sports and activity related injuries or strains . Acupress is all natural and made in the USA, made from herbs, and comes with a 48 page guidebook to teach you how to properly source and treat your pain. As a busy mom of three, I can't afford to give in to pain. Yet, I suffer nearly daily from pain related to previous joint injuries that causes debilitating pain located at the base of my skull in the back of my head. It usually presents itself with Migraine type symptoms with throbbing pain and pressure added in. Add to that a previous back injury and I have the makings of a very difficult day. I have tried many over-the-counter and prescription pain remedies with few helping to even "take the edge off." One topically applied cream does seem to help my back and occasionally helps my neck/head pain as well - but even that just eases but does not completely remove the pain. I was thrilled with the chance to try Accupress. But found that although it does soothe my pain, it has a menthol-type feeling when applied to my skin - and heats up like many sports rubs. I can not personally tolerate that type of pain relief medication, so for me the Accupress was a like/dislike. I liked that the pain did lessen, but did not like the heated after effects and menthol type warmth/smell that continued for hours after applying. If you can tolerate or like those menthol/heat type products then Accupress might be perfect for you as I personally think it is much stronger and works much better than the other similar products I have tried. Unfortunately it just isn't meant to work for me. Don't take my personal experience to heart - feel free to give it a try yourself as each person should judge for him/herself.